This dense and super moist yellow cake recipe from scratch is very easy to follow recipe which gives you a very moist and dense yellow cake that is homemade. You can make this super moist yellow cake at home following this easy homemade super moist yellow cake recipe. 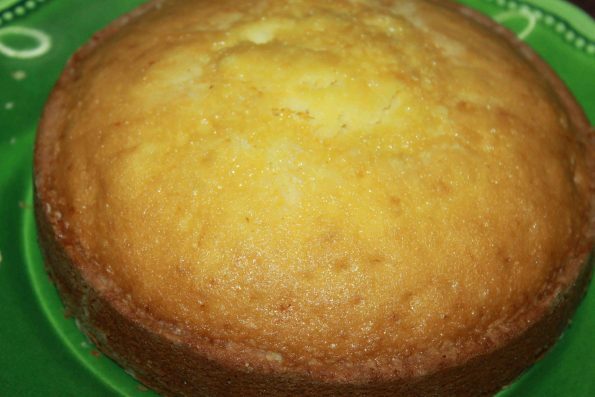 In fact this recipe is a homemade yellow butter cake recipe which yields a delicious yellow butter cake which is extra moist in texture and which can be easily made at home. Super moist, delicious simple yellow butter cake recipe for beginners can be easily followed with using just basic ingredients. The result is a dense but soft, moist and delicious yellow butter cake which can be served to guests even with out any extra cream or toppings. You may also make easy moist yellow butter cakes from the best moist yellow butter cake mix available online. This recipe for super moist yellow cake yields is a small yellow butter cake which can be served for 6 to 8 people. The cake is naturally dense and moist in texture and delicious in taste. This cake tends to rise in the middle where it is very soft, dense and moist. I recommend you to use cake strips to prepare your pan for best results if you prefer a flat cake. If you want to bake a flat level cake without using cake strips, reduce the amount of milk used in the recipe to 1/4 cup instead of 1/2 cup, however this will also make the cake less moist (still delicious though). If you do not mind the cake rising a little more in the middle, you can easily bake this without using the cake strips itself. The natural light yellow color of the cake is from the fresh butter and yolks of the fresh eggs used in the yellow butter cake recipe. Yellow cakes can be made using butter or oil. And butter cakes are always made using butter as you guess. So a yellow butter cake is a yellow cake made using butter (no oil is used here). As I already mentioned, the natural color of this yellow cake comes from the yolk of the whole fresh eggs used and also the butter. But you may also use few drops of yellow food coloring if you want to add more color. There are different kinds of yellow food colors available online, click here to see the different yellow food colors. Most popular ones include egg shade yellow color and lemon yellow color. For this yellow butter cake recipe, I suggest using egg shade yellow color or this regular yellow food color, if you want to use food color. Here are more pictures of how my yellow butter cake turned out. You can see the texture of the yellow butter cake below! This butter cake has got a wonderful texture and it is really dense, moist, soft and delicious. Make sure you use all the ingredients at room temperature, or it may affect the results. 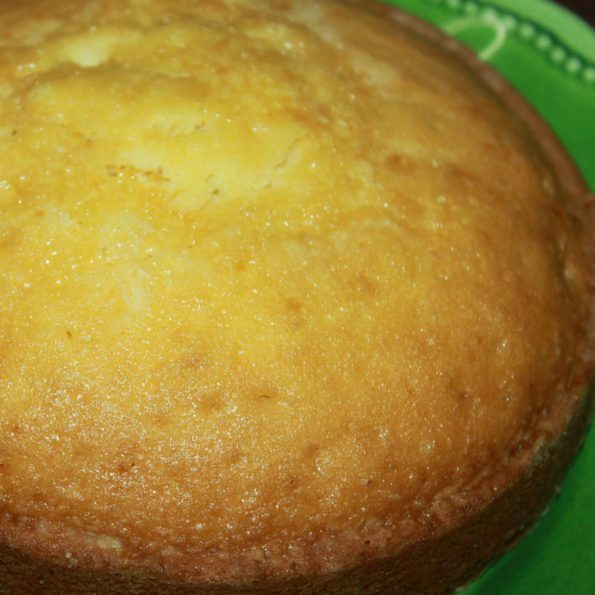 Easy, delicious, moist homemade yellow cake made from scratch makes a perfect dessert. In a bowl, mix flour and baking powder together. In another bowl, add the softened butter and sugar, beat well until well combined. Add the beaten eggs to the butter sugar mixture and whisk together to mix all ingredients well. Now add the milk and vanilla essence to the bowl, and mix well (add the food color also to the milk if you are using it). Slowly add this wet mixture to the dry flour mixture, stirring in between so that no lumps are formed. Combine everything together to form the batter. Prepare the cake pan by greasing with butter and dusting with little flour. You can also line the bottom of the baking pan with parchment paper which will help you to transfer the cake easily once it is baked. Also put the cake strips around the pan for even baking if you want a perfect flat level cake- make sure you follow the directions mentioned in the strips you are using. Pour the cake batter into the pan and bake this for about 45 to 50 minutes in the oven or until a toothpick inserted in the center comes out clean. Mine was done in 50 minutes of time. As soon as the cake is done, transfer it from the hot oven, allow the cake to cool down completely before you try to take it out of the pan or slice it. Since this is a moist cake, make sure to grease the pan properly and also dust the pan nicely with flour before you pour the batter. You can also line the pan with a parchment paper if you can which will help you to transfer the cake easily. If you are not using parchment paper and if the cake sticks to the pan, you can run a butter knife through the edges of the pan which will release the cake from the sides and then keep the pan upside down on a clean surface, rack or plate where you wish to transfer the cake. After a few minutes, gently tap on the top of the pan which should easily release the cake onto the surface. 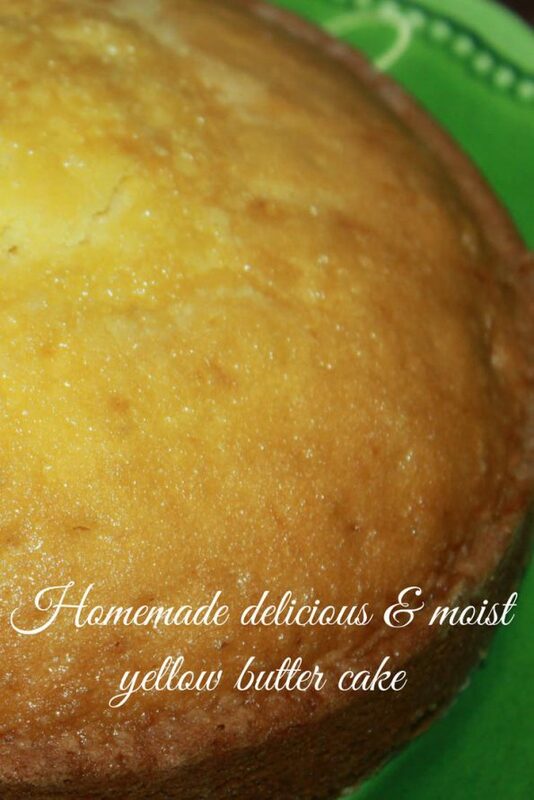 Hope you found this post on dense, super moist yellow cake recipe from scratch helpful!